The unique structure of furanocembranoid natural product bielschowskysin has provoked a number of biosynthetic hypotheses: quantum chemical calculations provide a means to assess the feasibility of postulated mechanisms in the construction of this unusual carbon skeleton. 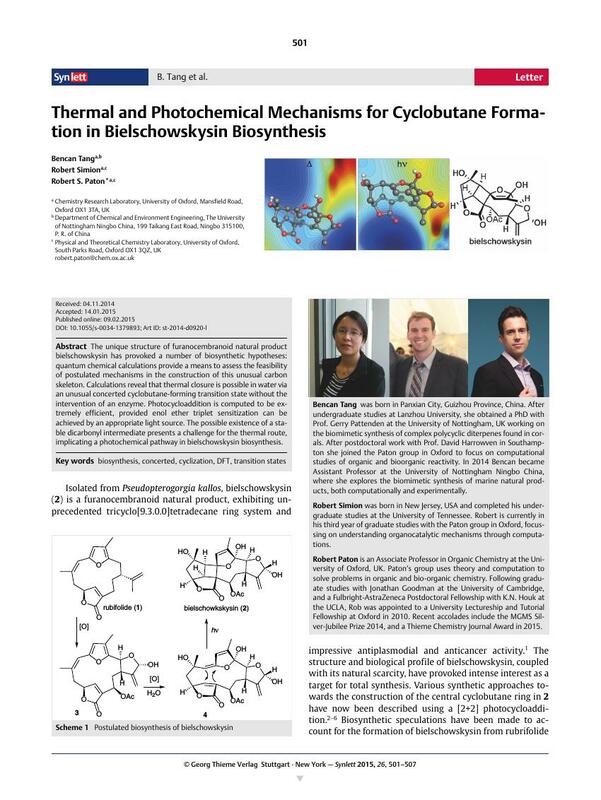 Calculations reveal that thermal closure is possible in water via an unusual concerted cyclobutane-forming transition state without the intervention of an enzyme. Photocycloaddition is computed to be extremely efficient, provided enol ether triplet sensitization can be achieved by an appropriate light source. The possible existence of a stable dicarbonyl intermediate presents a challenge for the thermal route, implicating a photochemical pathway in bielschowskysin biosynthesis. Supporting information for this article is available online at http://dx.doi.org/10.1055/s-0034-1379893. 18 All calculations were performed with Gaussian 09, rev. D.01. Structures were optimized using the range-separated hybrid ωB97XD density functional, which incorporates an atom-pairwise, density-independent (D2)-correction for the effects of London dispersion, in conjunction with the 6-31G (d) basis set for all atoms. Solvation effects were including during optimizations with an implicit conductor-like polariazble continuum model (CPCM) of water, ρ = 78.4. Stationary points were classified as either minima or transition structures following analysis of the harmonic vibrations, possessing zero and exactly one imaginary frequency, respectively. Transition structures were connected to corresponding minima by computation of the Intrinsic Reaction Coordinate (IRC). Free energies include unscaled vibrational zero-point energies and were evaluated at a temperature of 298 K and solution-phase concentration of 1 mol/l. Single point energetics were evaluated for all optimized structures with a larger triple-ζ valence basis set, at the CPCM-ωB97XD/def2-TZVPP level of theory. Molecular graphics were produced with PyMol, CYLview and MATLAB. A full list of computational references is provided in the Supporting Information with absolute energies and Cartesian coordinates. 19 We used a CPCM description of water to assess the uncatalyzed biosynthesis. Geometry optimizations were performed in solution due to the sizable change in dipole moment occurring in the thermal reaction. Calculations designed to mimic the apolar interior of an enzyme employed a CPCM description of diethyl ether, ρ = 4.2. 23 Natural Population Analysis (NPA) was performed using the ωB97XD/6-31G (d) ‘wavefunction’ with the NBO 6.0 package. 27 TD-ωB97XD/def2-TZVPP vertical excitation energies were obtained for excited singlet and triplet states with nonequilibrium CPCM water solvation. The triplet potential energy surface was computed at spin-unrestricted CPCM-ωB97XD/6-31G(d) level of theory.